Olentangy’s Emily Gernert rounds third base before scoring the first run in what was a 3-0 Division I district final win over Reynoldsburg Friday afternoon in Pickerington. Olivia Gregory, back, reached second on the play. 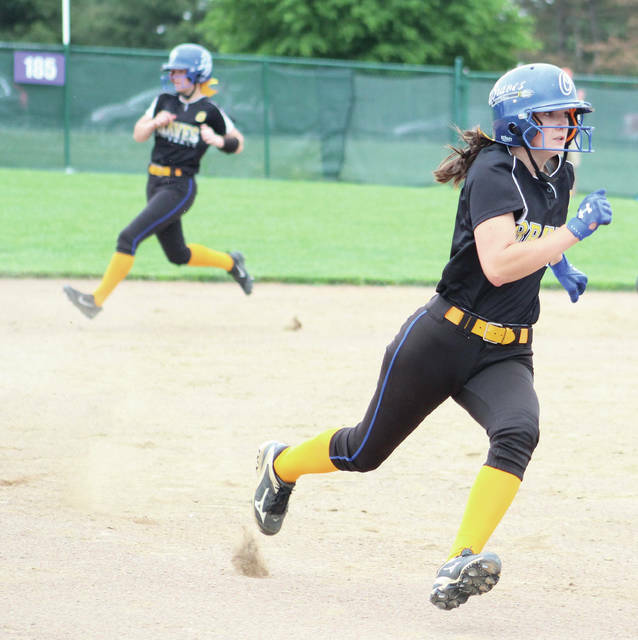 Senior pitcher Sophie Low turned in another masterful performance and Emily Gernert started a two-run rally with two outs in the second to lead the Olentangy softball team to its first district championship since 1999 with a 3-0 win over Reynoldsburg Friday at Pickerington Central. Low gave up a hit to Reynoldsburg leadoff batter Mackenzie Huey on the second pitch of the game. Huey was erased on a 1-6-3 double play to end the inning. From there, a runner reached on an error in the third, Huey walked in the fourth and Nicole Pearce and Alexis Langwaster each singled in the final two innings … and that’s it. “I kind of zoned in after (Huey’s hit),” Low said. “As the game went on – I felt stronger. I was just going after batters. She went the distance and struck out nine along the way, including a pair in the seventh inning to clinch the title for 13th-seeded Olentangy (18-11). Gernert, meanwhile, had two hits to lead the offense. She barely found the hole between short and third with two outs in the second. Olivia Gregory beat out a bunt and Brooke Wells lined a single. Gernert came home when the ball was bobbled in left and Gregory scored on a wild pitch to give Olentangy a 2-0 lead. “The bottom of the lineup — if they get on – we can score fast,” Tharp said. Morgan Cox led off the fifth with a walk and Olivia Davidson reached on an error. Payton Cox then found the left-center gap to bring in Olentangy’s third run. Huey went the distance in the circle and took the loss for 18th-seeded Reynoldsburg (15-10). She allowed two earned runs on six hits and three walks and struck out six. Olentangy meets the winner of Mount Vernon and Gahanna Lincoln in the regional semifinal at The Ohio State University’s Buckeye Field Wednesday at 5 p.m.
Jonathan Alder 20, Big Walnut 3, 5 inn. Big Walnut had the lead twice in the early going, but it couldn’t overcome a six-run second inning and a 13-run third in Friday’s Division II district championship game at Pickerington Central. Hailey Krinn led the game off with a double and scored on Molly Sharpe’s bloop single to give the Golden Eagles a 1-0 lead in the first. Alder leadoff hitter Lindsey Potter, who hit two home runs for the Pioneers, took the first pitch over the left field wall to tie it 1-1. Arielle Brown opened the second with a double, moved to third on a Meredith Thomas groundout and beat the throw home on Alyssa Tarney’s squeeze bunt to give the Eagles a 2-1 lead. Potter and Katelyn Perkins each hit three-run homers in the third inning to give Alder a 7-2 lead and Emily Walker blew it open with a grand slam in the fourth. Krinn led the fifth-seeded Eagles (12-13) with a pair of hits and a run. Stacey Walters took the loss after tossing the first 2.1 innings. Potter had three hits, drove in seven runs and scored four times and Walker had four hits, five RBI and three runs to lead the second-seeded Pioneers (19-6). Perkins went the distance to get the win for Alder. Alder advances to the regional semifinal where it will face the winner of Kenton Ridge and Monroe at Mason High School Wednesday at 5 p.m.
https://www.delgazette.com/wp-content/uploads/sites/40/2018/05/web1_tangyrunner-1.jpgOlentangy’s Emily Gernert rounds third base before scoring the first run in what was a 3-0 Division I district final win over Reynoldsburg Friday afternoon in Pickerington. Olivia Gregory, back, reached second on the play.